Are you bored of default interface color of Microsoft Word Office 2010 program on your Windows computer? 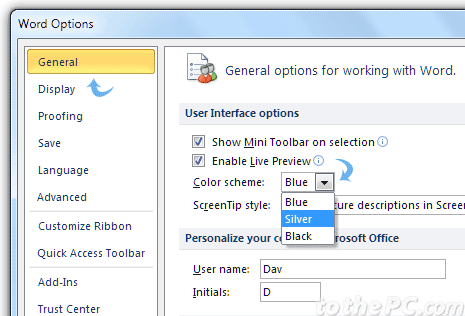 You can freshen up the look by customizing theme color of Office Word 2010 interface. 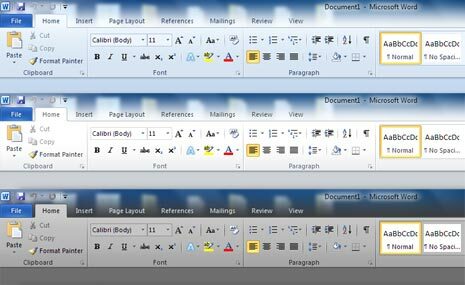 You can change between blue, silver or black theme color options for interface of Microsoft Office Word 2010 program using following method. 1. Open and launch Microsoft Word 2010 program on your computer. 2. Goto File option at top left and then click Options button. 3. In the Word Options dialog box under General tab use drop down box next to Color Scheme option. 4. Select either of blue, silver or black option and click OK to see interface with different color. You can select and work in Word 2010 program in interface color scheme most comfortable to you.